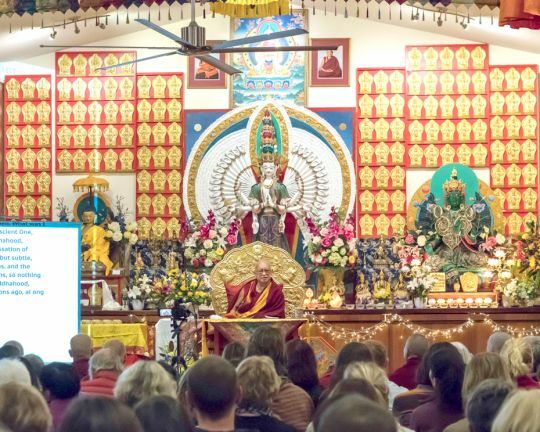 Lama Zopa Rinpoche teaching at Chenrezig Institute, Eudlo, Australia, June 2018. Photo by Ven. Lobsang Sherab. For older students, when you are looking for spiritual happiness, Dharma happiness, inner happiness—not the ordinary happiness that you have had numberless times already, in this life and from beginningless rebirths—I think the most important thing is if you live life every day with the basis that your mind is where all the sufferings came from. All the oceans of six-realm sufferings, the oceans of hell realm, hungry ghost, animal, human being, sura, and asura sufferings—all came from your mind. All happiness came from your mind. Your mind is the creator of everything. That is the most important thing. For the older students, even though you have heard that, then you have to live life with that recognition as the main basis. I think if it is the main basis, it helps unbelievably. It helps to bring immediate peace and happiness in your heart, in your life. Even though it is really the basic thing, you older students who received many teachings, studied many subjects, if you don’t live in that philosophy, that basic understanding, then even though you studied so many philosophical subjects, Madhyamaka, and this and that, Abhisamayalamkarika, this and that tantra subjects, studied so much, if you think the creator is outside, not you, not your mind, if you think that happiness and problems are coming from outside, as long as you think they are coming from outside, then you are the same as people who never heard Dharma, never studied Dharma. You are the same as the insects, the worms. What do insects think? They think everything came from outside, not from the mind, but from outside. So you are no different from worms, insects. Then you create so many problems in your life, so many problems. Then you continuously find an enemy in the world. You find an enemy in your family. Everywhere you find an enemy. As you know from Bodhicharyavatara, if you are going to cover the whole earth with leather, there is not enough leather to cover the whole earth. But if you cover your feet, you wear leather shoes, wherever you walk thorns don’t go through. It is like you covered the whole earth. You didn’t cover the whole earth, but it is like that. No thorn can go into your feet if you are wearing leather shoes. Like that, if you don’t have anger, then you have no enemy outside. You can’t find one anywhere. At the house in Aptos we have a car and on the back I put a label in big writing: “No anger, no enemy.” So on the car that becomes a good teaching, good advertising. It is the best advertising.